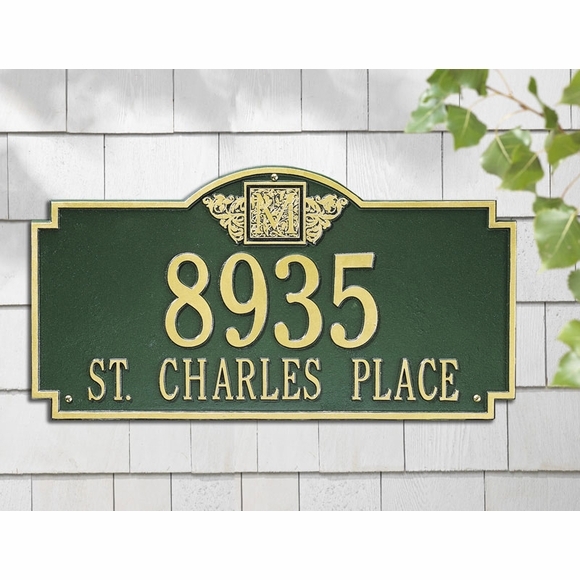 Personalized Monogram Address Sign - - estate size 23.25" x 12.25" decorative rectangle with exaggerated corners, small arched top with monogram insert, and large characters. Wall mount or lawn mount. Made in USA. Made to order in your choice of 16 color combinations and one or two lines of personalization. The one-line version holds up to five (5) 4.5" numbers or seventeen (17) 2" characters. The two-line version holds up to five (5) 4.5" numbers on Line 1 and seventeen (17) 2" characters on Line 2 as shown in the sample. the reverse: up to seventeen (17) 2" characters on Line 1 and five (5) 4.5" numbers on Line 2. Shown above in green with gold characters. Includes mounting hardware. Lawn mount version also includes two 18" lawn stakes. Click top links in Related Products for smaller versions of this sign.